2017 was a productive year for Aroostook County economic development efforts. A new Harbor Freight business opened at the Aroostook Centre Mall, a new Tractor Supply opened in Madawaska, Smith and Wesson expanded in Houlton, the ‘Maine Malt House’ business expanded in Mapleton, a new business ‘ TRP Truck Parts’ opened at Loring which provides both parts and service, the new $3.1M Acme Monaco expansion opened in the Presque Isle Industrial Park, the forest products sector flourished with both Louisiana Pacific & Huber having a great year, and the potato & broccoli crop quality was excellent. Overall, there was over $160M in business investment and an impressive 243 new jobs created throughout the County which brings our 5-year totals to over $900M in investment and 914 new jobs created. In fact, 2017 saw growth across virtually every sector of our economy from healthcare and agriculture to forestry and manufacturing. Small business growth was particularly strong as NMDC’s Small Business Development Center Director was nationally recognized for exceeding goals in assisting new business starts. And at Loring, several businesses are interested in that location, but they will require an anchor business such as aviation to provide the business base to justify their development. The County also had a lot of exposure and interaction with the rest of Maine in 2017 as the Aroostook Partnership (AP) held their ‘Aroostook Day at the Legislature’ in January with 25 legislators and more than 60 total attendees. The key topics discussed were the economic benefits of forestry and mining as well as the need for welfare policy revision to enable and incentivize the unemployed to re-enter the labor force. In February, in coordination with the Maine Development Foundation, we hosted two busloads of legislators for a County tour and economic, demographic and collaboration discussions to give them a better appreciation for Aroostook’s economy and challenges. Tourism efforts were also more aggressive as AP teamed with the Aroostook County Tourism Board to produce a very attractive and informative tourism map in addition to the revised County Tourism Guide. And in September, AP hosted a business luncheon with the leaders of the new National Monument to begin a dialogue of how we can work together to bring more attention to the County and the Monument as that project develops. In Energy, Emera Maine continued to modernize our infrastructure and the two ReEnergy biomass power plants benefited from a power purchase agreement the legislature approved to allow the sale of electricity to the state. Multiple wind projects and the transmission interconnect worth billions of dollars responded to the Massachusetts clean energy request for proposal and should hear if they were selected in 2018. Unfortunately, ReEnergy notified the system administrator that they may have to shut down in the fall of 2018 if they are unable to get new contracts. This could greatly impact our forest sector economy as well as the County’s power reliability. 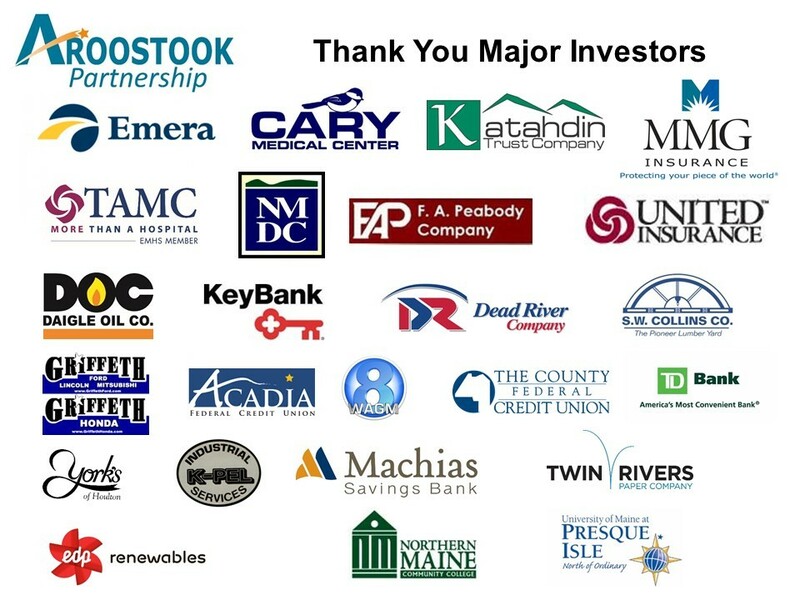 Regarding energy challenges, the Aroostook Energy Association was formed to work with AP and Emera Maine to pursue solutions to enable policies and practices that can maximize the greatest energy stability for County businesses. The Maine Public Utilities Commission will visit Aroostook in January to hear business concerns and suggested ideas to keep the ReEnergy plants operational and approaches for policy revision consideration. 14 years ago, the ‘Tarnished Crown’ report analyzed the County’s economy and population trends and concluded that the private sector needed to participate in economic development. That report was the motivation for forming the Partnership. This year, AP contracted to have this economic analysis updated and the final report entitled ‘Caring for the Crown’ captured both the progress and the challenges, especially with our demographics, that are projected for the County over the next 10 years. The projections are alarming and a top priority for 2018 will be to determine a strategy and actions to increase engagement to turn around these projections. Looking forward, the Partnership’s top priority remains growing the County’s future workforce. Almost every major employer is seeking additional qualified workers and the challenge is growing. AP is working with our high schools, our local colleges, and our major employers to increase awareness of the existing and projected employment opportunities and promote internships, apprenticeships and company tours throughout Aroostook. We’ll continue to collaborate with our Chambers of Commerce and agencies like SADC, ACAP, AAI, Junior Achievement, Jobs for Maine Grads, and our Career & Technical Education schools to promote retention efforts. And in 2018, we intend to reach out to groups such as Empower Aroostook, Momentum Aroostook and young professionals to assist in attraction efforts using social media and our Opportunities Aroostook website.